The Statue of Liberty on Liberty Island in New York Harbor is a New Wonder of the World Runner-Up and a World Heritage Site. It is a symbol of freedom and democracy and of the friendship of the United States with France that goes back to the American Revolution. 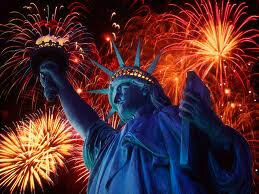 The Statue of Liberty was planned to commemorate the centennial of the American Declaration of Independence in 1876 but it was not dedicated until 1886. In France, public fees, various forms of entertainment, and a lottery were used to raise the money to fund the statue. In the United States, benefit theatrical events, art exhibitions, auctions, prize fights and private donations were used to fund the pedestal for the statue. Sculptor Frederic Auguste Bartholdi assisted by Alexandre Gustave Eiffel (designer of the Eiffel Tower) designed the Statue of Liberty in the Neoclassical style. The Statue’s copper skin was attached to a massive iron pylon and secondary skeletal framework which allows the statue to move independently yet stand upright. 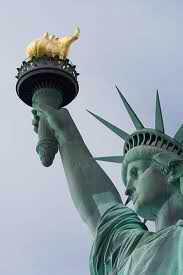 The statue is of a robed female figure (wearing a stola and pella of Roman goddesses) representing Libertas, the Roman goddess of freedom, who lifts a torch and holds a tabula ansata (a tablet representing the law) in her left hand inscribed with the date of the signing American Declaration of Independence, July 4, 1776. 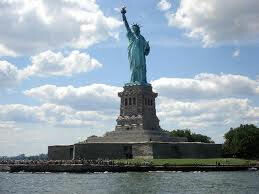 The face was modeled after that of Charlotte Beysser Bartholdi, the sculptor’s mother. In 1884 the Statue was completed in France and in June of 1885 shipped to the New York Harbor in 350 individual pieces packed in 214 crates on board the French frigate “Isere.” It took four months to reassemble the Statue on the granite pedestal inside the courtyard of Fort Wood on Bedloe Island. The Statue of Liberty was maintained by the United States Lighthouse Board until 1901 when the care and operation of the Statue was placed under the War Department. After Fort Wood and the Statue of Liberty were declared a National Monument, the care and administration of the National Monument was transferred to the National Park Service and the island’s name was changed to Liberty Island. In 1986 after undergoing an $87 million restoration the Statue was re-opened to the public to celebrate the Statue’s centennial.